I'm a great fan of historical fiction, particularly in children's literature. 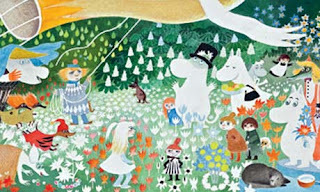 In the Guardian's Book Blog, Imogen Russell Williams has posted a wonderful article outlining the value of children's historical fiction, not just in it's telling of a great story and quality of writing, but in the benefits of the stories themselves in inspiring the imagination and thought processes of young readers. She not only speaks eloquently of older fiction writers like Rosemary Sutcliffe, whose tales of Roman Britain such as Eagle of the Ninth are simply magnificent; but also of some more contemporary favourites bringing the past alive again... Kevin Crossley-Holland, Celia Rees and Sally Gardner (whose I, Coriander and The Red Necklace bring to life some brilliant aspects of history, mixed with a slight mystical content that effortlessly seems both magical and completely possible.) An article well worth reading, as are all the books mentioned. On a personal note, I'm going to recommend The Crowfield Curse by Pat Walsh. Think of it as The Company of Liars for 9 to 12 year olds. I've put a brief over view of this on the 'What ARE You Reading' page, if you want more information. Children's Books Ireland teamed up with O'Brien Press for the third year in a row to give young, budding designers a chance to see their designs as the cover art of a professionally published book. 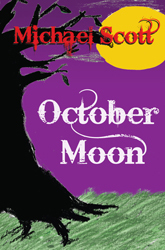 During the October Children's Book Festival, a call was put forth for submissions to grace the front of a new edition of Michael Scott's Irish horror story October Moon. And this winners have now been announced! The launch of October Moon with it's brilliant new look, courteousy of O'Brien Press and Adina McNulty, and the prize-giving ceremony for all the brilliant young designers will be held on Friday, 4th March at 12pm in Dublin City Hall and is free to one and all. My absolute favourite children's author/illustrator, Emily Gravett, has shared a spread of her award winning picture book illustrations in the Guardian (Tuesday, 22nd February.) The selection of spreads take us from her first book, Wolves, through to her latest triumph, Wolf Won't Bite. It takes nothing less than pure genius to get the balance of illustration and text just right in a picture book. In Gravett's books, few words are used or needed, and seem to act merely as accents for the sentiments and actions expressed in her highly expressive illustrations. 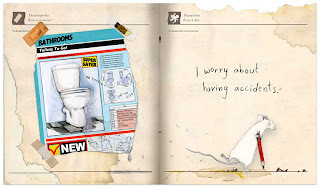 Her commentary explains her thought processes while working on her always evocative and delightful books. 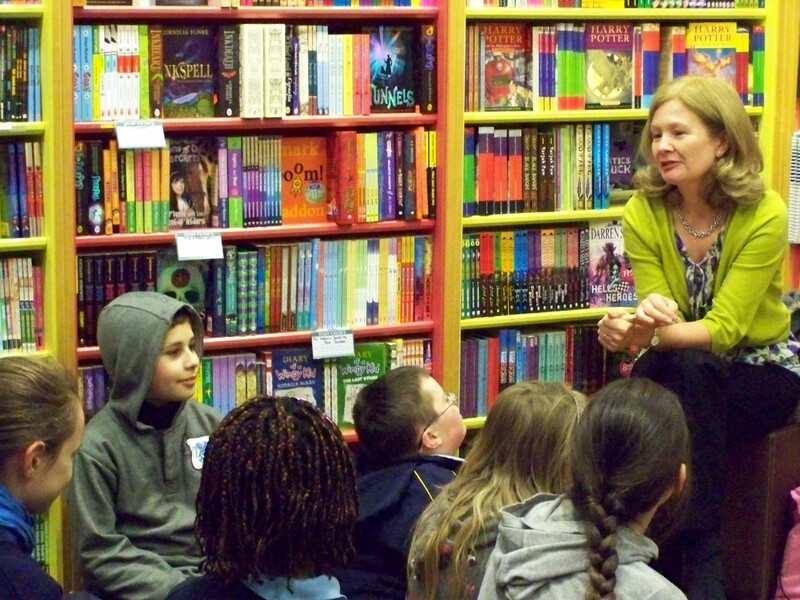 It's a very exciting time for children's literature in Ireland at the moment. 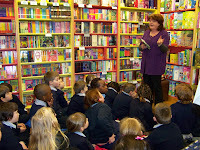 World Book Day is next Thursday, 3rd March and the number of events and children getting involved grows every year. Next week is also the time for us to celebrate Seachtain na Gaeilge ('week of the Irish'), so we all need to use our Irish language skills (even if they are very limited.... trust me, mine are very limited.) And, if this wasn't enough.... the good people at Children's Books Ireland are preparing to announce the shortlist for the 21st annual Bisto Children's Book of the Year Awards. With this in mind, the call is being put to all school teachers, librarians and young readers all across Ireland to sign up and take part in this year's Shadowing Scheme. The Shadowing Scheme is a guided reading programme designed to involve young readers with the 10 titles selected for the shortlist, and to allow them the opportunity to give their input on the selection. Registration is free, and participation is always exciting. When the Bisto Awards are announced, a special Shadowing Scheme award is given based on the input of the children. And I have always thought that if you want to information on a good children's book, ask the children. So, I whole-heartedly ask all of you out there, whether you are teachers, librarians or if your child or teenager is involved in a reading group or book club, please, please register for the Shadowing Scheme! 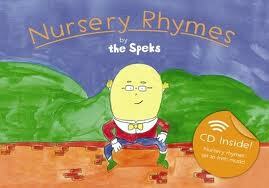 A couple of weeks ago, a dear friend of mine brought me a copy of 'Nursery Rhymes' by The Speks. This is a book filled with many traditional nursery rhymes for young children (such as 'Sing A Song Of Sixpence' and 'Humpty Dumpty', etc.) brightly illustrated and includes a CD to sing along with. But, this is no ordinary nursery rhyme CD/book. Rather than the expected, rather plummy voice warbling along to old-fashioned music, The Speks (a clever group based in county Clare) have set these rhymes to Irish music.... and the children just love it! Unique and thoroughly wonderful, I highly recommend it! You can check it out on their website, or pick up a copy at a great bookshop near you. Just a quick reminder about World Book Day. 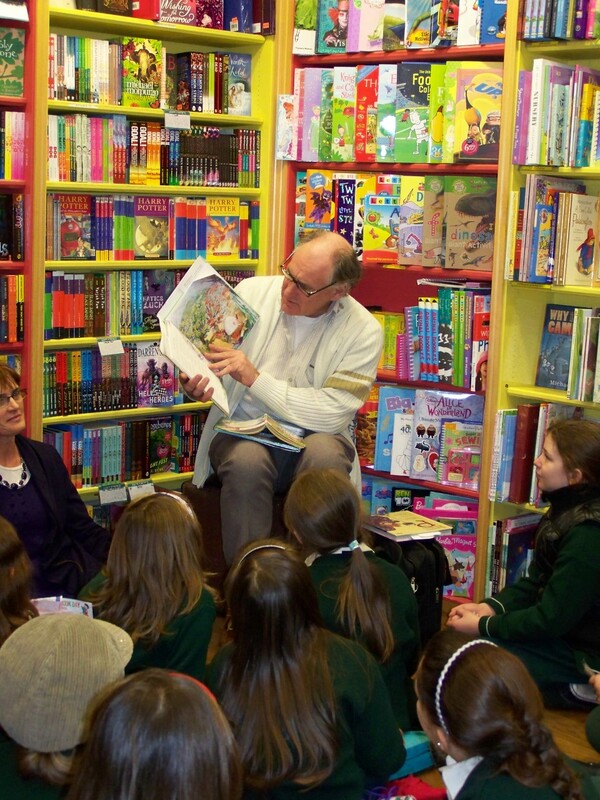 On Thursday, the 3rd of March, we will be celebrating the 14th annual World Book Day, with events happening all over the UK and Ireland. Always exciting! Here's the link to World Book Day Ireland's page, for those of you who want more information on what World Book Day is all about. From there, you can access all the other information on World Book Day worldwide. 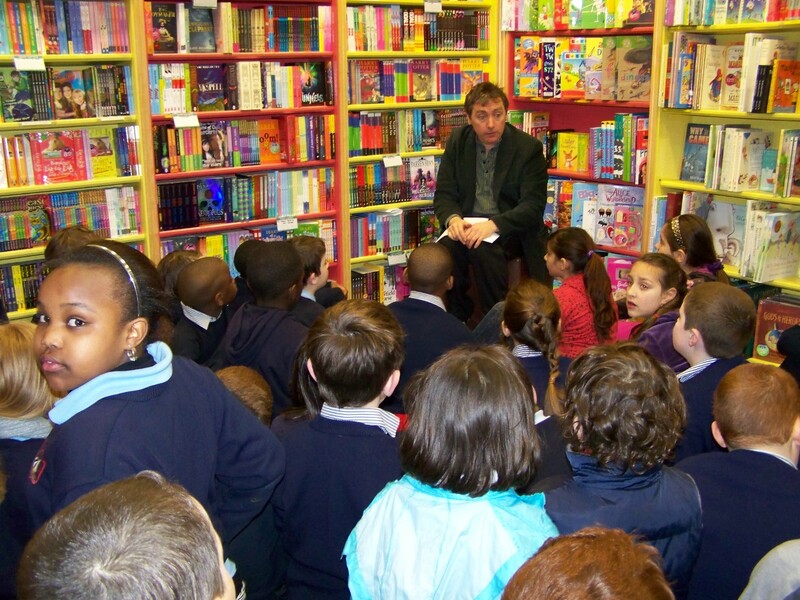 I can assure anyone who's wondering, during the entire week (Monday, 28th February - Friday, 4th March), the typical madness and joy will be taking place in Dubray Books, Galway. 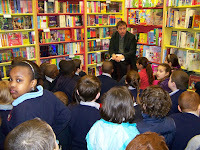 To show you what I mean, here are a few photos from last year (2010), featuring some of our guest authors and some local school children. I just received the February newsletter from 'Young At Art', those brilliant people who, each year, put on the Belfast Children's Festival! They have announced new dates for the Festival. Rather than taking place in May, the Belfast Children's Festival will be moving to March. Not this March, naturally! They'd be too pushed for time to put on all the marvellous events that make this festival so exciting. 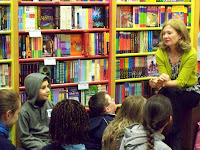 The next Belfast Children's Festival will take place from 9th through the 16th March, 2012... which is going on my calender right now! Debut author Sita Brahmachari has scooped the Waterstone's Children's Book Prize 2011. The shortlist was tough, with a stunning line-up of competitors such as, Tall Story by Candy Gourlay, When You Reach Me by Rebecca Stead, The Healing Wars I - The Pain Merchants by Janice Hardy, A Beautiful Lie by Ifran Master.... all on the list were very worthy. But the winner is...... Artichoke Hearts. This is the story of twelve-year-old Mira and her chaotic, artistic family. As her beloved Nana's health declines, Mira finds herself facing grief for the first time in her life and beginning to ask all the big questions. A beautiful coming-of-age story! Congratulations Sita! On a much happier note, the extremely popular (over 100 million copies sold worldwide since 1971) Mr. Men book series is to be turned into a Hollywood film. Producer Shawn Levy (responsible for the 'Night At The Museum' films) is currently working on the adaptation of the project, Twentieth Century Fox confirms. No director or screen writer has been named, at this time. It is with great sorrow that I report the passing of another brilliant children's author. 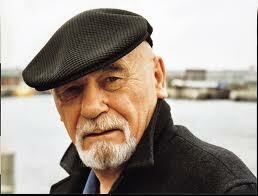 Brian Jacques, the author of the Redwall series has died at the age of 71 years. The Tales of Redwall are a series of magical stories, set around an abbey populated by animated mice, rats, birds and a badger. Marvellous historical fantasy fiction, the basic premise of all 21 books surrounds a clumsy, young mouse, Matthias, who dreams of one day becoming a warrior.Eventually, Matthias realises his dream. Through hard work and remaining persistent and dedicated, he becomes a true hero, though never quite losing his endearingly clumsy nature. 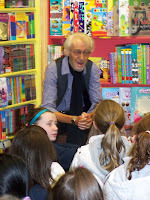 The books have been compared to Tolkien's work and 'Watership Down', and showed Jacques true gift as a storyteller. Jacques passed away over the weekend after suffering a heart attack. He is survived by his wife, two grown sons, and millions of Redwall fans worldwide. I hope that all of you who can are going to be at Rab and Marina's performance of 'Pirates, Dragons and Moon Monsters' tomorrow at 3pm. As part of the Muscailt Festival, they can be found on the UCI Galway campus at the Art Gallery in the Quadrangle... and it's all free! And please check out their wonderful blog... Rab Swannock Fulton's beautiful poetry accompanied by exquisite artwork by Marina Wild. 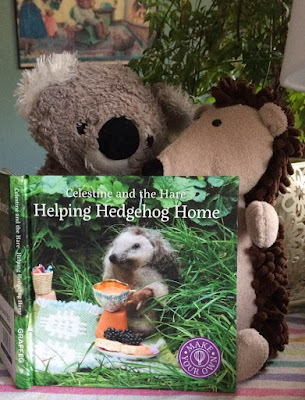 A brilliant blog for children of all ages! 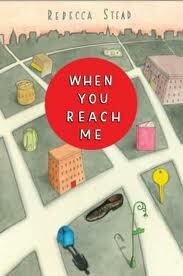 I came across this wonderful, poignant review of 'When You Reach Me' by Rebecca Stead. It can be found in this weekend's Guardian and was written by the amazing Philip Ardagh. Brilliantly observed by Ardagh was the centre point underpinning the entire story. I just finished watching 'Meet the Author' with Nick Higham at the end of the BBC News. Tonight's guest was the wonderful Jacqueline Wilson talking about (among a number of things) her new book, 'Lily Alone'. Wilson is well-known for writing children's books with a different approach to the old familiar Enid Blyton-type, with heroine's who have more than their fair share of challenge in life at very young ages. In 'Lily Alone', 11 year old Lily finds herself taking care of three younger siblings while her feckless mother runs off to Spain for a week with her new boyfriend. While Lily copes amazingly well, of course, things don't go to plan. With all the news about ebooks and IT and the affects on the publishing industry, a new study carries out by the ABA shows that children's books are going to be 'a very secure category in the marketplace.' 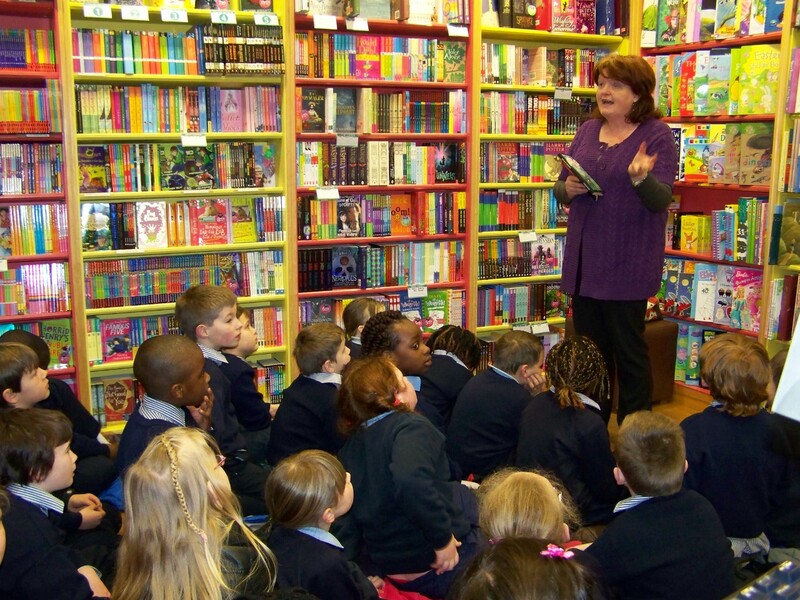 The study further goes on to say how libraries and bookshops continue to play a significant role in helping young children discover books and add that 75% of children's books are purchased in a physical bookshop (as opposed to online purchases.) A lot of the study's revelations came as little surprise. However, perhaps the most astonishing statistic brought to light was.... books outranked all other media in importance to young children. Fantastic!